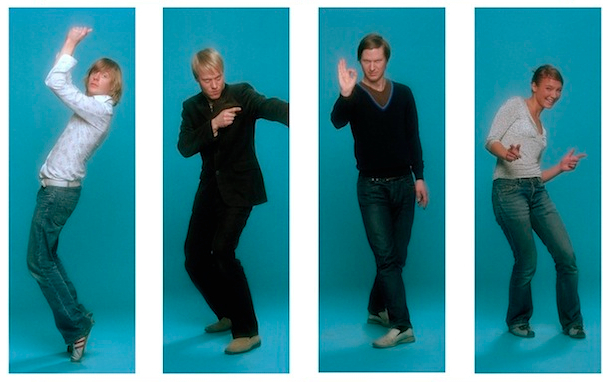 Swedish indie pop band Acid House Kings was formed in 1991 in Stockholm by siblings Niklas Angergård and Johan Angergård and their friend Joakim Ödlund. With immaculate taste in music stemming from a childhood listening to everything from Elvis Presley to The Smiths, the Kings set out to define Scandinavian pop music. When the band released their first studio album, Pop, Look & Listen!, back in 1992, they allegedly decided on a 10-year plan to release an album every five years in order to have a trilogy of albums released by the year 2002. According to plan, Acid House Kings released their second album, Advantage Acid House Kings, in 1997 and the album proved to be a huge step forward to form their trademark sound of jangly, catchy guitar-oriented indie pop. The album featured Julia Lannerheim as guest vocalist on a couple of songs, who eventually joined the band officially as a full time member in 2001. This was right about the time when the band built their own, now famous, Summersound Studios. In this protected environment, they spent endless hours creating the more sophisticated third album Mondays are like Tuesdays and Tuesdays are like Wednesdays, released in 2002 on Labrador. In traditional AHK fashion, the follow-up to this album, Sing Along With Acid House Kings, came out five years later in 2007, still on Labrador. Now, after (only) four years of silence, Acid House Kings are back with a brand new album, Music Sounds Better With You, out since March 2011 on Labrador. It’s coherent and cohesive and, with its ten perfectly polished pop gems, this album is probably the band’s best to date. This work might not re-define pop or showcase in a radically new sound but Acid House Kings definitely show that they know the rules of the genre and have what it takes to craft some heartfelt, and yet charmingly sweet, pop songs.